Hi friend! I hope you’ve had a beautiful week. Whew! What a busy fall this is shaping up to be, in the absolute best way of course. Something about the cooler weather always kicks me into high gear when it comes to working on behind the scenes on my biz. 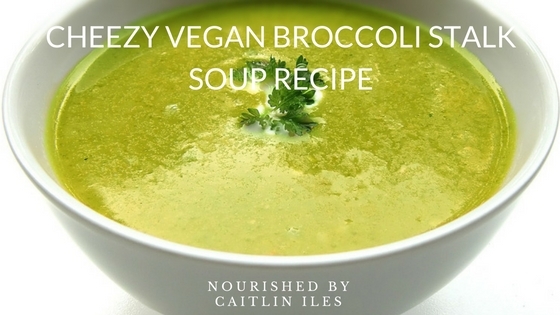 I’ve created tons of new recipes for you to enjoy and today I thought I’d share one to help you make use of all your expensive ingredients: Cheezy Vegan Broccoli Stock Soup. When you’re transitioning to a whole foods diet, it’s great to start thinking about purchasing foods that contain less pesticide residue so that you can take some of the burden of detoxification off of your liver. With this new way of eating can sometimes come a bit of sticker shock at the cost of some of these organic, whole foods. I have some great tips on how to stretch your dollar further right here, but another great way to stretch your dollar is not to throw away nutritious and useful parts of your produce! You can also shop at your local farmer’s market for seasonal produce. It can often be a bit cheaper because there is no middle man between you and the grower and as a bonus you can really get to know and trust who grows your food. This recipe for Pickled Kale Stems is one great way to get creative with your leftovers and I think this delicious soup is another way to wring every last ounce of nutrition out of your healing produce. To cream it up you’re going to be adding some cashews, though you can always sub for a cup or two of coconut milk if cashews aren’t your jam. And to get that delicious cheezy flavour you’ll be using my favourite condiment: nutritional yeast! I’ve talked a bit about it in my Sweet & Salty Kale Chips Recipe, but suffice it to say that it contains some protein, B vitamins, and enough deliciousness to justify its inclusion in almost any recipe. As a quick note in regards to the broccoli stalks: I like to store them in the freezer until I have enough to make a batch of this soup. And feel free to use the whole head of broccoli. I just tend to eat a ton of roasted broccoli, like it’s a bit obscene to be honest, so I end up with a lot of leftover stalks. You can also add some kale stems and cauliflower stalks if you want to get super jazzy! Now without further ado, the recipe! Heat a large saucepan over medium and add olive oil. Once oil starts to bubble slightly add onion, garlic, and thyme, stirring to combine and then covering for 1 minute until slightly softened. Add celery stalks, broccoli stalks, broth, cashews, and sea salt. Increase heat to high and bring to a boil. Once boiled turn to low and allow to simmer for 15-20 minutes until veggies are fork-tender. Stir in nutritional yeast, vinegar, and maple syrup then blitz with an immersion blender until smooth. Allow to simmer 5 more minutes. Well friend, that’s a new deliciously creative way to make use of some kitchen scraps! I hope you enjoy it. If you’re looking for more fun fall recipes, why not try a hand at fermentation and download my easy peasy Fantastic Fermentables E-Book by clicking here? It’s packed with delicious vegan & paleo super simple recipes for all things fermented. As always, have a beautiful day!